How Could You Define The Best Osteopath In London? 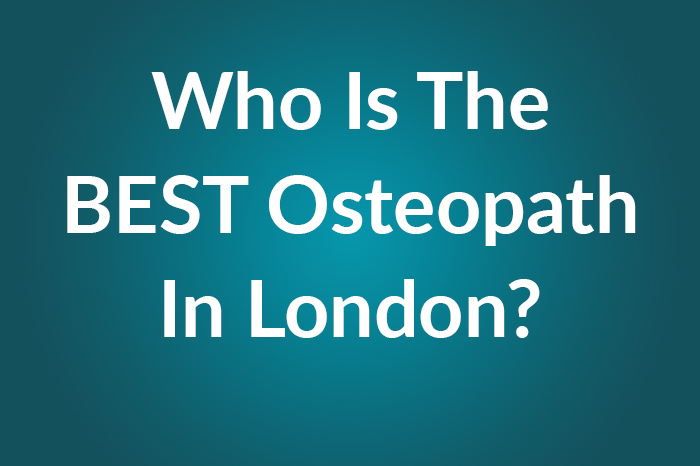 Who is the most experienced osteopath in London? Which osteopath is the most knowledgeable? Who has the best osteopathic techniques in London? The problem with these questions though is that they are far too broad. Osteopaths are able to work on the whole body from head to toe and work on people of all ages and physicalities. This basically means we can work on anyone (assuming it is safe to do so). But what if you were looking for an osteopath who could treat your 6 month old baby? Seeing the osteopath with the most experience, knowledge or techniques doesn’t mean they have the most experience with babies, or the most knowledge with babies. So if you are searching based on the above questions you should make them more specific to your problem. For example, if I had a shoulder problem it would be better for me to search for the most experienced osteopath with shoulder problems. In my opinion there needs to be balance. The most experienced osteopath in London will probably mean they have been qualified the longest. But this could also mean that their knowledge or methods are “old school thinking”. The osteopath with the most knowledge doesn’t necessarily mean they can apply that knowledge to getting you better. Or the osteopath with the best techniques might not make you feel comfortable by they way they talk to you. How Should You Decide Who To Go And See? Like I said above there needs to be some balance. I would say that all three of the above ingredients are a good start. If it was me looking for the best practitioner for me I would want someone with a good amount of experience, someone who is knowledgeable about my problem and who’s techniques feel competent and effective. But in my opinion the best osteopath in London is not one particular practitioner. I think the best osteopath is the one who is right for you. What I mean by this is the practitioner who understands you and your problem, who can talk to you on your level and make you feel comfortable in their presence is the right practitioner for you. Admittedly this has nothing to do with the most experience or the best techniques it has more to do with them matching your personality. The reason I say this is because if your osteopath can make you feel comfortable and you can put your trust in them then their application of their techniques will help you recover much faster. So the best osteopath is the practitioner who gets you feeling great, who you trust and who’s personality you feel comfortable with. Every osteopath out there is the best osteopath for someone. Now that we have got that out of the way, here are a few other places I would start my search. If you ask your friends or family members you can usually be sure they will give you good recommendations. No one wants to make a bad recommendation because it will look bad on them, so they will only recommend someone they feel is good. Ask them why they like the person they are recommending and what made their practitioner so good in their opinion. Have a look on Google or on a practitioner’s website for testimonials or reviews. Quite often as you’re reading through them you will find that other people have experienced similar problems to you and this may give you an insight as to whether this practitioner may be able to help with your issue. If you are wheelchair bound you will need to be able visit a facility that has wheelchair access. If you are not fluent in English is there a practitioner who speaks your language? You can find out some of this information in the Register Search page of the General Osteopathic Council’s website. The next step will be to look into the practitioner or practitioners you have narrowed your search to. Have a look at their profiles or their social media (if they have them). Do they seem approachable and friendly? Do they seem passionate about what they do? Once you have a good idea who you like, give them a call if you have any questions. Can they reassure you over the phone? Are they helpful and friendly? Do you get a good feeling about them? If they tick all the right boxes for you then you have a good chance that you’ve found the right osteopath for you. I hope this article has given you some idea of what to look for when you’re choosing a practitioner. In summary the best osteopath in London is the one who you feel the most comfortable with and who you trust to get you out of pain. If you want to find out more about Osteopathy have a look at our osteopathy page or to find out more about what we do, have a look through our website and if you have any questions at all please get in touch by calling 0203 356 7060 or emailing us at info@precisionwellbeing.co.uk.